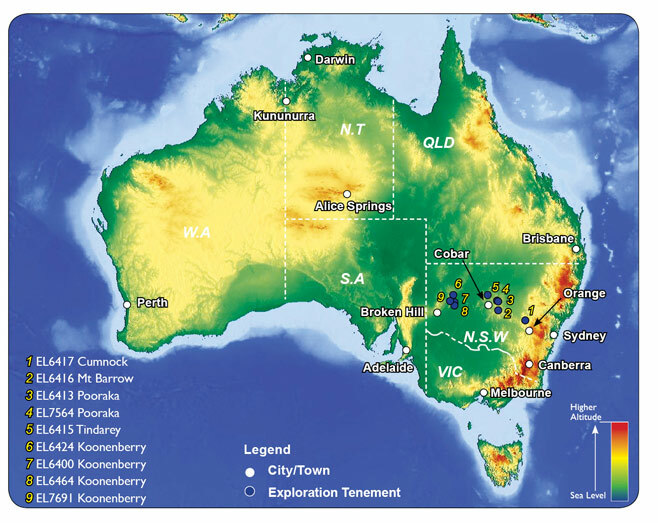 Ausmon Resources is a new Australian exploration company which aims to grow by acquiring interests in prospective precious and base metals, energy related resources and other minerals tenements, exploring, evaluating, developing and proving mineral resources and, in time, mining the resources. With an initial focus on gold, silver, copper and other base metals in the Lachlan Fold Belt in NSW, Australia the Company acquired under a Farmin Agreement 85% interest in four exploration licences EL 6413 (Pooraka), EL 6415 (Tindarey), EL 6416 (Mt Burrow) and EL 6417 (Cumnock). The licences are within the Lachlan Fold Belt which hosts a number of major mineral deposits, including Cadia/Ridgeway near Orange. The Company also acquired, for cash consideration, 100% interest in a licence in NT (EL 26007 Mary River) with potential for gold, silver and uranium. In 2009, the Company acquired 100% interests in four ELs (EL 6400, 6424 6464 and 7691) covering a total area of 779 sq km in the highly prospective and under-explored Koonenberry Belt.